Card Text Play: Place 2 from the common supply on an enemy creature. 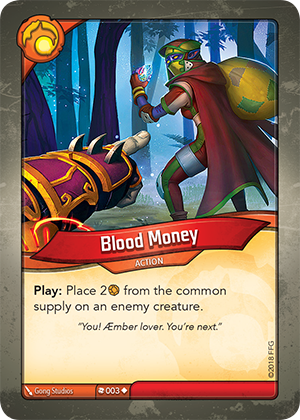 What happens to the Æmber placed on the creature (the target of Blood Money) when it leaves play? When the creature leaves play, the 2 Æmber gets placed into the Æmber pool of its controller’s opponent.